I was only dimly aware at the time, but while the Harrier had been a very serious engineering project right at the leading edge of aeronautical possibilities, it was a machine for a niche market. The future of the company, and more importantly my pocket money, rested on the success or otherwise of the Hawk, a much more attractive proposition to the many young air forces growing up around the world, not to mention the Royal Air Force who badly needed a modern training aircraft to replace the ageing and troublesome Folland Gnat. The staging around the new Hawk had been removed, rather like the launch tower of the Apollo rockets of the time retracting before the leap skywards, but this time taking days not minutes. XX154 stood alone on her wheels in the Experimental Hangar; Dad walked me around the sleek red and white shape, his fellow workers grinning and saying hello, I knew many of them as Dad was captain of the social club golf section on the airfield, my mother and I often accompanied him as he and chums went around the rather pleasant nine hole course on the largely wooded far side away from the hangars. Mum would usually stay with the other wives and organise the catering, while I would stroll around with the golfers or go and explore the woods and the dried up Wey and Arun canal and the ruins of wartime dispersals, air raid shelters and gun emplacements left by the Canadians who had built the airfield in 1942. 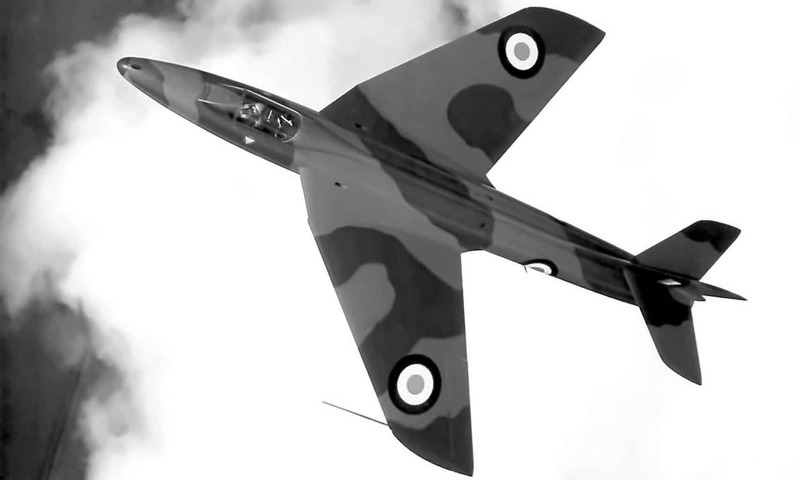 There were also old aircraft to play with, Hunter jet fighters used by the fire service for training, and the fuselage of an Avro Ashton, a failed airliner project of the 1950’s. For a small boy it was heaven ! “ Christ Stan, you’ll be for it if they see you ! ” called a fitter, but Dad carried on; I stepped on then sat down in the front ejection seat – I didn’t know about checking the safety pins to ensure it was disarmed, but Dad knew all that. Later in life it would be hammered into me, by Dad and instructors that whenever, ever, getting in or standing on an ejection seat it should be second nature to look for the primary three bright red disarming pins first; a fair few people at aircraft manufacturers or in the services have stood on live seats, caught their foot under the handle and been fired into the hangar roof or if outside high enough to guarantee a fatal landing. Another essential part of dealing with ejection seats and aircraft in general is that one must always empty one’s pockets before entering a cockpit, even the smallest piece of FOD – Foreign Object Debris – might jam a vital linkage in the controls or seat mechanism. I was oblivious to all this as I sat grasping the Hawk’s control column, half Biggles, half Scot Tracy of Thunderbird One. Soon my time was up, and next day at school my classmates either refused to believe me or feigned indifference – the first flight on that day’s national news only sparked interest among my closest friends, but I knew I’d been in that cockpit before Chief Test Pilot Duncan Simpson ! Six years later I joined what had just become British Aerospace, at the previous Hawker Siddeley’s large headquarters factory at Kingston On Thames. I was very lucky to gain an apprenticeship; though not as rare as nowadays there were still over four hundred applicants for thirty places. The snag was though, it was a Craft hands-on apprenticeship; I was qualified for and much more suited to a Technician Apprenticeship, and to this day I wonder why they put me in Craft, quite possibly because Dad was on that side. I quite enjoyed the associated academic courses at Kingston College, but was otherwise utterly miserable, largely due to the Dickensian conditions of the Apprentice School; I struggled to file an intricately shaped aircraft panel to four thousandths of an inch all round, and when I finally did get it right the buffoon of an instructor accused me of breaking into his safe and filing around the master pattern ! As I explained to him with my nose about one inch from his, if I could have broken into safes that easily I wouldn’t be bothering with his crappy school… I would probably have left British Aerospace altogether, but salvation was at hand. The head of the Apprentice School asked me into his office, and sat me down. Rex assured me it was no worry at all and was the epitome of kindness, but the instructors who’d heard about it couldn’t resist putting their heads around the door to look. Once some normality had been restored, Rex explained that the photographer at Dunsfold was snowed under with work, and urgently required an assistant; they reckoned a technician apprentice would fit the bill with suitable training, would I like it ? I didn’t even consider myself a keen photographer,but I had learned the basics and a bit more, even played at some special effects things with models – the sort of models inspired by Space 1999 sadly, not page three, but even I could tell this was a once in a lifetime plum opportunity. I grabbed it with both hands. I was introduced to the resident photographer, Jim Moore, a slightly bluff, dour man at first acquaintance, but I was soon to learn he had a wicked ex-RAF sense of humour. I went on to have a mainly very happy fourteen years at Dunsfold Photographic, a typical day might be photographing the details of where the latest avionics box didn’t fit for the designers to work out, or if it did fit, details of how to do it to aid the fitters electricians and all the other trades at a busy aircraft final assembly and testing base. Almost as soon as I had joined, I was sent to Wales to manage the Pilot Display Recorder camera for a trial testing the then new Sea Harrier fighter with the Sidewinder air to air missile; of course it all just seemed a technical exercise to us in 1979, ticking a box in the development of the aircraft. We never dreamed the data and lessons learned from those tests, along with the resulting clearance to use the missile, and indeed film for the BBC to use, would be put to good effect in three years time over the Falkland Islands. 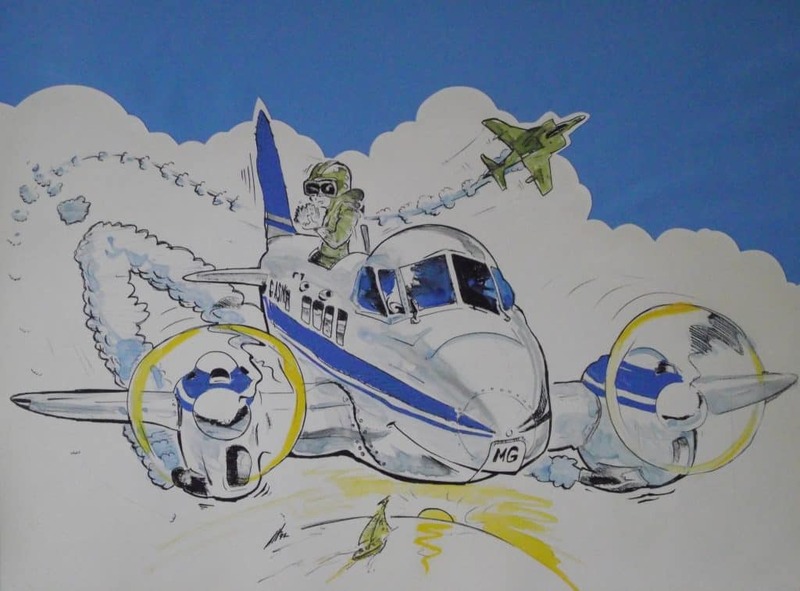 I noticed that my old friend XX154 was there at Llanbedr, used as a photographic chase aircraft on the trials of other aircraft and systems; as a pre-production aircraft it was not suitable for the ongoing Hawk trials as the salesmen kept finding new markets and requirements. That was the last I saw of XX154 as I got on with my busy BAe photographic career. At Dunsfold there was the occasional public relations shot to take, pretty pictures of the aircraft on the ground or in the air, our ‘ photo ship ‘ usually being a venerable De Havilland Dove, a wonderful old twin engined eight seat postwar passenger aircraft. Importantly for our purposes G-ASMG could manage 150 knots, so we could have a Hawk alongside with its flaps up ‘ clean ‘ which looks much better; unfortunately a Harrier requires 270 knots for this, so when they were alongside they had to have flaps and nozzles partially down, semi-jetborne to assist the wing lift. A very useful feature of the Dove was the large removable loo window, so one could shoot through clear air rather than the thick perspex of most aircraft. I did work out a technique for photographing through perspex on other aeroplanes, but as opportunities to take aerial shots were always fought over Jim and I kept this to ourselves. The Hawk has been a major export success for UK Ltd as a fighter / bomber as well as an advanced trainer and of course is well known for its use by the Red Arrows. I was lucky enough to be given a ride in our company demonstrator, G-Hawk, with Deputy Chief Test Pilot Chris Roberts, an ex- Red Arrows pilot- we were in formation with another Hawk filming us doing simulated air to air and air to ground combat, an experience I won’t forget in a hurry. In my job I was fortunate to spend a lot of time in the air photographing aircraft alongside or subjects on the ground of interest to the company; or, often, of interest to the pilots, their friends, or myself. I spent a lot of time with Chris Darwin, an ex-Navy Phantom pilot who was great fun to be with, and sometimes gave me the controls; a memorable occasion was when he let me fly it above cloud over Wales, pointed out a ‘ valley ‘ in the clouds and said “ go for it “ – I flew us along with our wingtips brushing the clouds, like the attack sequence in Star Wars. Chris also suggested that, rather than the loo window of the Dove, why didn’t we take out the upper escape hatch just in front of the tailfin ? That way I’d be able to take the elusive head-on shots of subject aircraft that the salesmen craved but otherwise required an aft facing camera pod on a fast jet, a very expensive operation requiring a big budget and lots of planning. I was all for it, and modified my sailing dinghy trapeze harness by wirelocking the open end; Harry at the aircrew safety equipment bay fitted me out with a crash helmet and gas-proof goggles and I organised a rope and a friend to tail it around a seat mounting, as we weren’t quite sure how much drag there would be on my upper torso as I poked out of the top of the aeroplane. In a proper flight testing process we started slow at 120 knots and built up in increments of 10, I signalled to my chum in the cabin below I was happy to go faster and he relayed that to the pilot, I didn’t have the luxury of an intercom lead. The pilot of the Dove was Mike Oliver, Senior Gnat Test Pilot for Follands a while before, and a racing driver in his spare time, a thoroughly decent chap who was always happy to talk about aeroplanes – Chris was following the Dove in the Seminole as a trial photo subject. The magic figure of 150 knots – Hawk clean flaps up speed – was reached, though I found the slipstream was such that I couldn’t raise my arm for the usual hand signals to the subject aircraft; an intercom would be essential. However when we informed PR that we had a new much cheaper way of getting head on shots, instead of their being pleased I had a very stiff letter from some head of department accusing me of trying to muscle in on fast jet photography work. I sent an equally stiff letter back explaining perhaps he had not noticed when I said no fast jets other than the subject would be required – of course he knew I had, but I also knew he’d be jumped on by his superiors as to why he was complaining about a money saving idea. Meanwhile I had developed a close relationship with the excellent Flight Test engineers, the main raison d’etre of Dunsfold Photographic was to fit and run the specialised high speed cine cameras on the aircraft for trials. 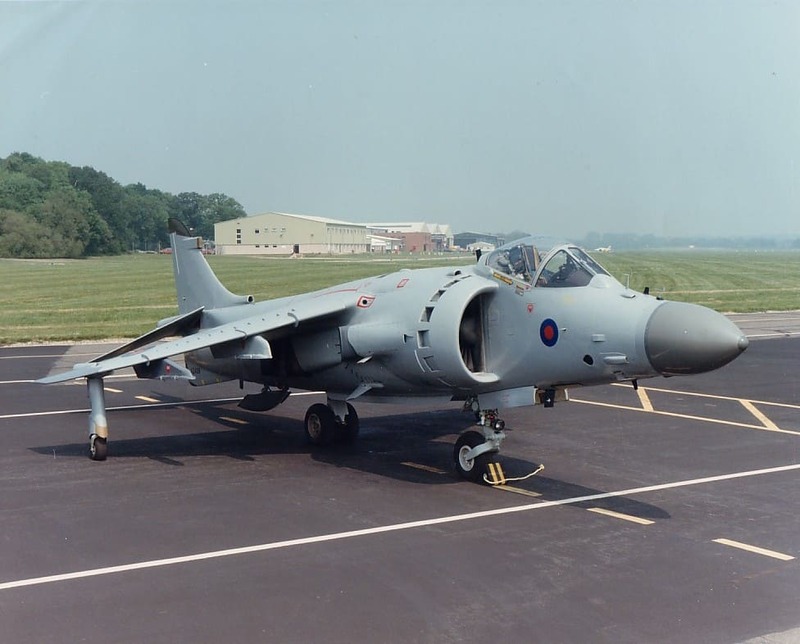 Dunsfold then had a steady stream of Harriers and Hawks emerging from final assembly, to be production test flown then delivered to the customers; when the first aircraft of a new contract was handed over to a customer it was of course a very big deal, as it involved millions or billions. I remember photographing the handover ceremony with the first Sea Harrier to the Indian Navy, with large Indian flags draped over the hangar gables. This was obviously not the sort of thing one could rehearse as it involved foreign dignitaries, so it came as something of a surprise when the very pretty Indian lady in traditional dress produced a coconut and went to smash it on the fibreglass radome as some sort of blessing ! I have never seen anyone move so fast as Chief Test Pilot John Farley, he just managed to place himself between fragile aeroplane nose and coconut, then very diplomatically persuaded her to smash it onto the rather sturdier noseleg. I often spent time away, sometimes months, at test ranges, usually West Freugh in south west Scotland, dealing with camera pods observing the release of weapons or fuel tanks as they were ejected from the aircraft, or the Pilot Display Recorder cameras which recorded the symbology of the Head Up Display as well as the outside world. All these trials were for Flight Test and avionics engineers to evaluate the kit, but mainly to check the pilot and aircraft were safe as each item was dropped or fired from the aircraft at various speeds and angles, not risking hitting it in any way; this was a real concern, even bombs have been known to ‘ float ‘ in a high speed slipstream, sometimes destroying aircraft as others had found out the hard way. Usually on these trials my father Stan was in charge of the groundcrew, and I am not being biased when I say, with his experience from WWII Seafires onwards he was the crew-chief of choice on any important trial, he also looked after the groundcrew and logistics at big shows like Farnborough and Paris*, sadly I did not get to cover the latter. Dad is that rare kind of person, he knew what he was good at and stuck to it, refusing promotion; the Test Pilots voiced their gratitude for this. Probably fortunately I was tied in with the Flight Test team, so we did not have the potentially awkward situation of my working directly under my father. I’d grown up at Dunsfold since a toddler, I met my first fiancee, though we didn’t know it then of course, playing on the swings at the social club when we were about five. Seeing what the newcomer accountants were doing -and what had happened to John Farley, forced out for having principles, was like seeing an old friend with a bad illness, it was heartbreaking. A generous redundancy package was being offered, and one day I was asked to the new airfield manager’s office ( a northern ex-storesman had been installed to suit the northern directors, compared to JF being ex-Chief Test Pilot ! ) – very sneakily when Jim was on holiday – I was told one of us had to go, the other would just do factory photography, there would be no more test flying or trials work. Jim had a couple of years to go before making his full retirement and pension, while I was about to get married with my in-laws’ house to live in, in Somerset which I knew well and loved – while they were away every summer; it was a no brainer, I took the money. Apparently this took the accountant / overall ‘ manager ‘ by surprise, and in a typically heartless touch Jim was made forcibly redundant, leaving before I had served my three month notice. After a while of this I’d had enough and beckoned for the mic’, “ This place was built in 1942 for a major part in something called World War Two; some of you may have heard of it, it was quite a big thing at the time, after that it has been the source of billions of pounds worth of export for UK Ltd and is a historic airfield – some NIMBY’s here today might consider that ! “ The mic’ was grabbed away in horror, but I got a thin cheer from our lot. I didn’t think much more of it, until in 2004. I saw they were planning a major new airshow also involving historic cars called ‘ Wings And Wheels ‘ – on the off chance I called, “ have you got a photographer lined up ? ” – “ err, didn’t think of that, come along .” I went and chatted and agreed to cover the show for free using their kit – it was after all a charity event and I’d be happy just to be back at Dunsfold. He couldn’t know my boyhood link with XX154, what was I going to say ?! I stood and waited on the apron outside the pilot’s tower, chatting with 154’s current groundcrew, Baz’ and co; she was – and still is, touchwood – used as a chase aircraft at the A&AEE research base Boscombe Down in Wiltshire now. 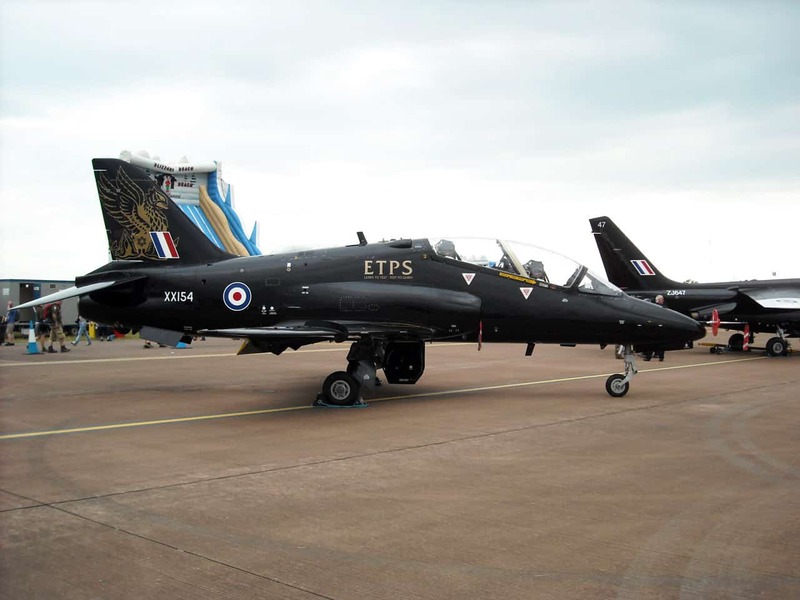 We were a little disappointed to see she is now the standard RAF Hawk black, instead of the original red and white livery, even moreso when it turned out some clot had organised this just short of her 30th Birthday; but what mattered was she was here, taxied up and parked neatly . The familiar sound and smell of an Adour engine spooling down washed over me for the first time in over 20 years; the service delivery pilot was politely hustled out of the way while the local TV news teams and self took pics of the original Test Pilot, Duncan Simpson, saying a few words. the Dove ( ‘ Mike Golf ‘ to us ) is in Australia now; she went to New Zealand originally, then on to Aus. Unfortunately the owner, who has been in contact with me, has had to ground it due to main spar corrosion; he held a collection both there and in the UK but sadly so far the funds required have not been raised. I was once being given a few minutes jolly in the co-pilot’s seat of Mike Golf on the way back from a Harrier trial in Scotland; we happened to be passing fairly near Heathrow, and Air Traffic called ‘ Mike Golf, for interest Concorde passing beneath you heading west ‘ – I scampered back to tell the guys in the cabin and that glorious white dart passed silently beneath, climbing steeply and disappearing into the setting sun – I also remember my only flight ( sadly ) with John Farley, when he flew us in Mike Golf; I am not kidding, we did not know the wheels had touched the ground until the scenery was going by so slowly we couldn’t be flying. I was very lucky to have these experiences. XX154 celebrated her 40th Birthday a while ago, she’s still used for chase work at Boscombe Down; Baz and co presented her with a cake in the hangar. Do you remember me worked at Dunsfold from 69 to 90, though most of the time i was off base as apart from the first 2 years in the Experimental department I was with Product Support traveling the world as a Fitter and later as a Tech Rep on Harrier Hawk and Egyptian Air Force Mig 21. Ive run into a chap who is looking for High Res negs of the Red Arrows fitted with Sidewiders and Aden Gun for a book he is writing . Please drop me an email of call 07710 426681 and we can discuss further. great meeting you at the reunion, the Hawks with AIM9L’s and 30mm Aden ( if suffering insomnia see my bit here ‘ buildings – cannon ) instead of the smoke pods – which my Dad was in charge of originally installing – would be the T1A’s, they were painted ‘ War Role Grey ‘ apart from the Red Arrows, kept red in what was I suspect a PR move.